Home Arts & Culture Pukkelpop 2011 festival stages collapsed in Belgium. At least 3 deaths confirmed. Indiana State Fair stage collapsed before Sugarland concert. 4 deaths and more than 40 people injured. 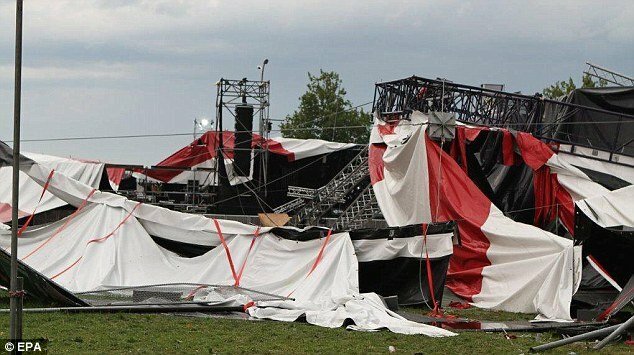 [googlead tip=”vertical_mic”]Two stages of the Belgian music festival Pukkelpop 2011 have collapsed after a sudden storm and at least 3 people died. The victims were all attending Pukkelpop 2011 festival near the town Hasselt, east of Brussels, when the storm struck, bringing the stages down. Hilde Claes, the mayor of the town of Hasselt, where Pukkelpop festival is held each year, confirmed two of the deaths earlier this evening, but reports emerging from Belgium have said that at least 3 festival-goers have been killed. The mayor also said those injured are taken to several nearby hospitals. Some of those lightly injured were being treated at a local sports complex. Hugo Simons, Hasselt’s head of emergency planning, told VRT radio that 11 people were severely injured while 60 have light injuries as a result of the storm. More than 20 ambulances were dispatched to the Pukkelpop ground. Earlier reports of the Belgian media said four people had been killed. The stages were destroyed by falling trees during severe storms. [googlead tip=”lista_medie” aliniat=”stanga”]The situation is still unclear at Pukkelpop festival’s location, about 75 km east of Belgium capital, Brussels. According to NME, the rest of the night’s schedule will more-than-likely be called off. Rap star Eminem is due to headline the concert tomorrow night. Local TV footage from the scene, showed fallen stage rigging and people scrambling for cover and rain-soaked festival attendees bracing against strong winds. Fallen gantries and rigging could be seen on the ground. 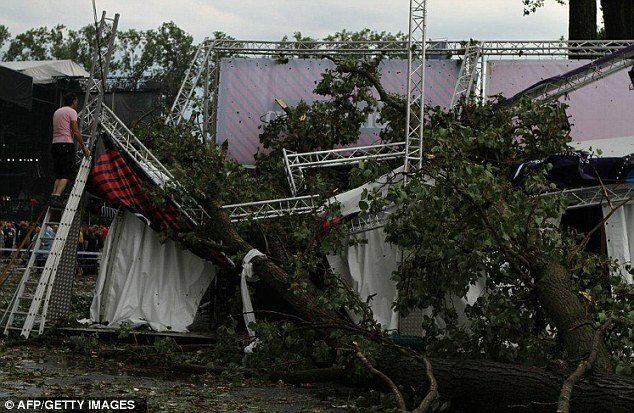 Belgian media reported that trees were uprooted by the violent storm and smashed into the stage, bringing it down. Some festival-goers said on the Twitter website that a tornado had struck. According to BBC, the storms swept across Belgium in the early evening, turning the sky dark. About 60,000 people were believed to attend the three-day Pukkelpop music festival, one of Europe’s largest outdoor festivals. Last week, 5 people were killed at Indiana State Fair in Indianapolis, US, when a stage collapsed in high winds. Israel: new air strikes on Gaza in response to Eilat attacks.